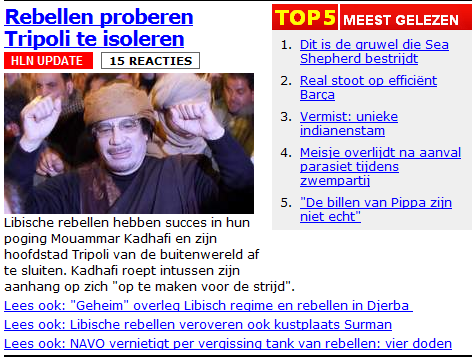 Crises, Rebels, Journalists & Bloggers. On labels & labeling. I’m not that different from any human being on this planet. 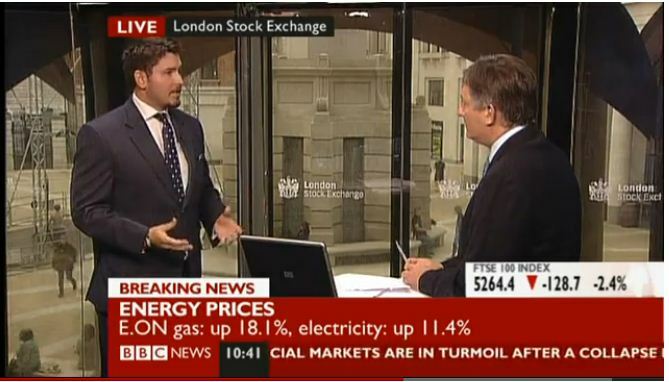 I also watch TV news bulletins almost everyday. Yes, it offers me a window to the world. It shows me what’s going on. However, I came to realize the news is a heavy filter. Time to pull up the shutters, it’s noon. Labeling is describing someone or something in a word or phrase. That specific word or phrase is consequently a “label”. Without going into details of labeling theory, it’s important to realize that the very act of labelling is necessary for communication. You have to give something a “name” (aka label) so to communicate about it right? It’s logic that journalists deploy labels and labeling techniques. After all, they are all human beings. However, they are human beings with a dramatic impact on society. Their act of labeling impacts how most people on the globe think about and frame certain events, evolutions, etc. Let’s demonstrate “labels and labeling” with 3 real-life examples. Mortgage crisis, credit crunch, debt crisis, economic crisis, etc. I guess you’re quite familiar with the above “labels” today, as they have been largely present since a couple of years in the news. What’s remarkably striking however is that these terms have been deployed consecutively, one by one, the one after the other. In this manner it seems as if we’re hit by multiple different crises. I believe this is not the fact. 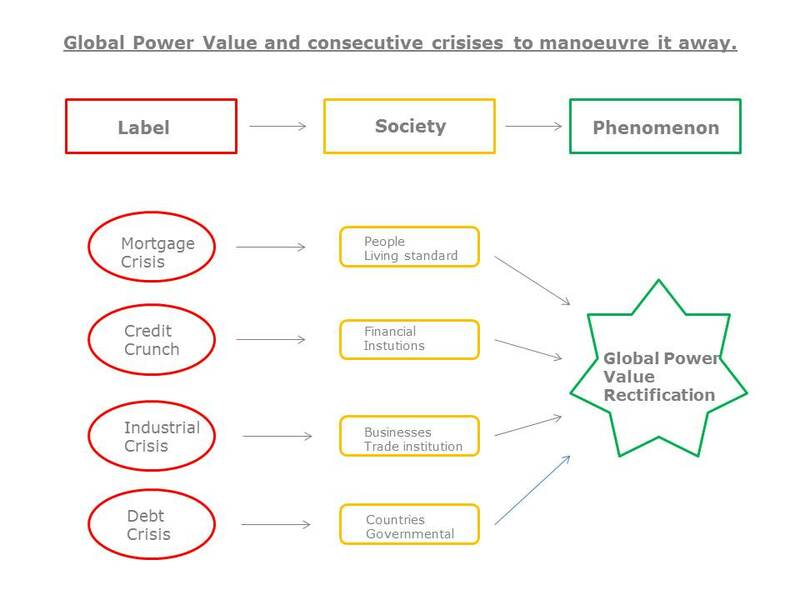 All labels in fact point to one deeper phenomenon: rectification of global power values. 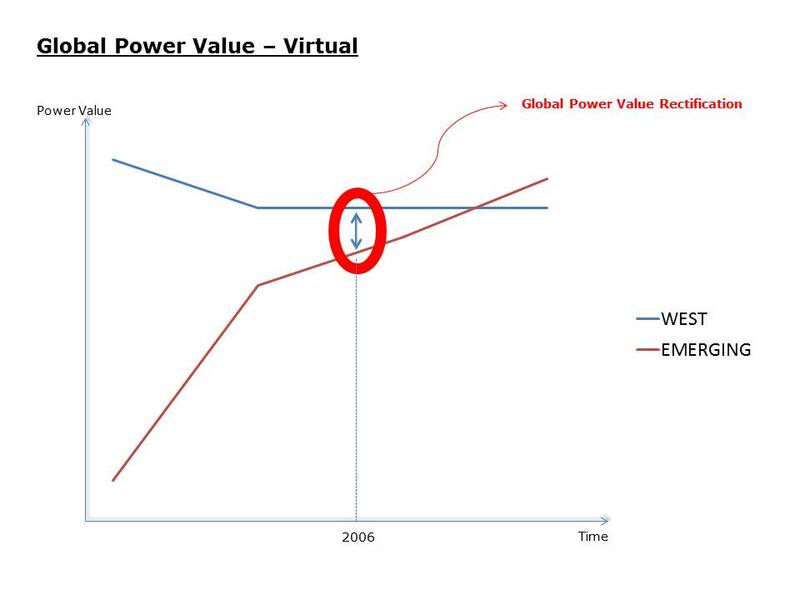 The concept of Global Power Value Rectification is not that easy to understand. Maybe that’s why journalists don’t use it to frame the crisis story. However, as a non-journalist, you have more time for interpretation and analysis. So why not try to explain this concept and consequently understand the framing of the different crises. I hope the below definition and graphics make clear what I label “Power Value Rectification”. is manoeuvred away through crises. Global powers - a reality check? 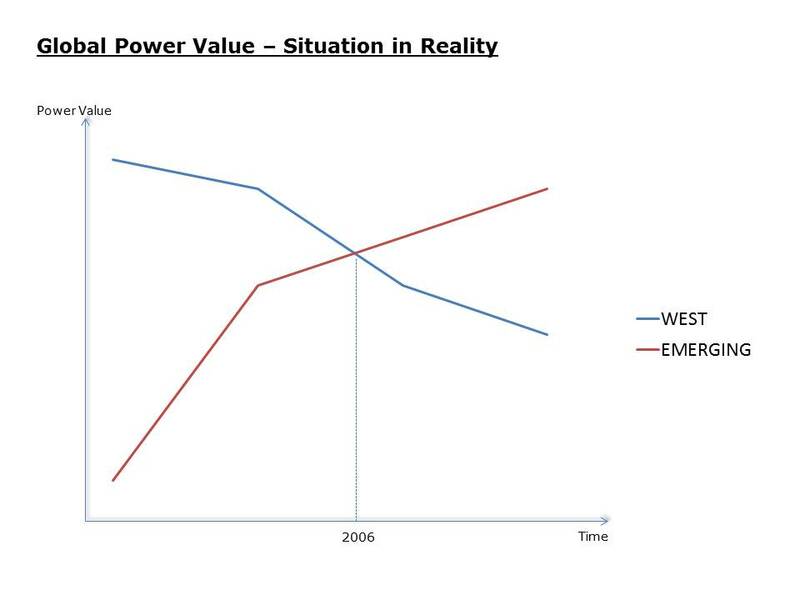 Global Power Value Rectification as underlying phenomenon to frame the crisises. Well, that should be about it for the first example of “journalistic labeling”. What I’m trying to prove here is that all crisises are related and have a deeper reason: the change in global power. The crises are the process that rectify the difference between real and virtual value. There’s only a new name (label) to it because it happens at different structural levels that construct society. Once all structures have gone through their crisis, the deeper reason – rectify global power – is gone and consequently all crises, up until a new rectification is required. This was a rather difficult example of journalistic labels, I know. But it was the starting point in my thinking on labels, so it’s a well-deserved first place. The next case should be easier to understand: the labeling of freedom fighters as “rebels” during the Arab Revolution. You often hear about the “Rebels” fighting the Arab Revolution. Quite frankly, this is a pretty strange label. After all, these people are actually fighting for freedom. Labelling them freedom-fighters would make a difference. Why do you call them rebels? I happen to associate the label rebel with negative and bad feelings, while freedom-fighter suggests they are “rebelling for a cause”. What about you? Overlooking what’s being said above, one can state that journalists are still important to provide us a window to the world but that we should always keep in mind that they are also humans who use labels so to interpret, understand and communicate about the world. I believe there might be a role for additional interpretation from bloggers around the globe. It might be note-worthy in this respect to relate this to the “blogger vs journalist debate”. A journalist is formally employed at a professional media organization whereas a blogger is a more ad-hoc individual initiative. As a result the blogger has more freedom, time, less pressure and is able to frame stories more in-depth. Or am I just completely wrong on this whole labeling issue? 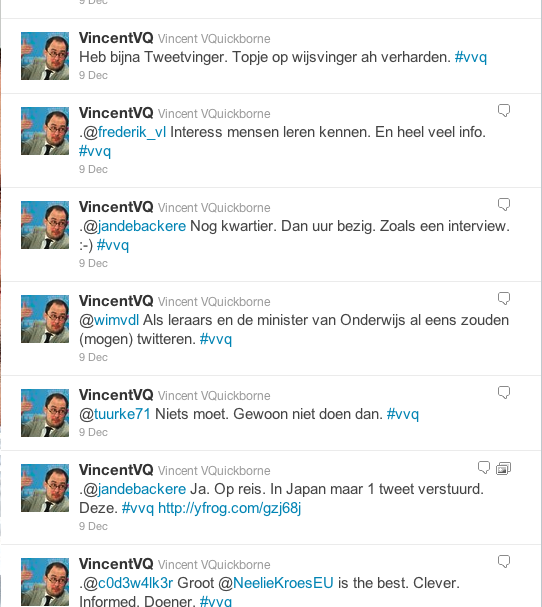 Citizen journalism & Citizen service: Twitter-interview Belgian Minister. A couple of days ago, a Minister from the Kingdom of Belgium organized a Twitter-interview. The “event” was organized in cooperation with a newspaper. As a result, a lot of Q-A occurred between the Minister and officially registered journalists of a publishing group. We do understand this of course. However, the “Twitter-interview-experiment” could have meant the start of “Citizen Journalism” and “Citizen Service”. The first being a form of journalism that enables anyone to take part in the news-making process. The latter being an informative, collaborative and conversation platform for governmental organizations. With the rise of the internet, journalism gradually changed. Anyone could create articles through blogs. Everybody could be a journalist. They just had to start a blog and write articles. Today, there’s something even more interesting: Twitter. The interview on December 9 demonstrated that in fact anyone with a Twitter-account could have interviewed the Minister. Anyone was able to ask questions. Everybody was an interviewer. Citizen service: Twitter as a tool for governments? The event did not guarantee your question to be answered. Should there be a dedicated governmental service to make sure all citizen questions are answered? Can Twitter be a useful medium for this? Can governments deploy it to further bridge the gap with their citizens? Is it useful to inform citizens about new laws via a twitter feed? Would it be beneficial to build up conversations about essential social themes over Twitter? Could Twitter bring the government closer to the people? Could this result in happier citizens and an improved quality of life? Understanding Dutch? Read the Twitter-interview here.